In my Gentile view Rabbis Sacks and Miller and all who think like them are in complete denial of the link between Israel’s actions which sometimes amount to state terrorism and the transformation of anti-Israelism into anti-Semitism. We Israelis must be careful lest we become not a source of pride for Jews but a distressing burden. 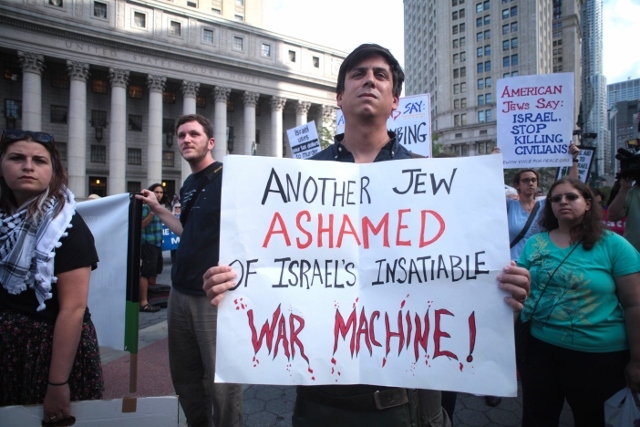 Israel is the criterion according to which all Jews will tend to be judged. Israel as a Jewish state is an example of the Jewish character, which finds free and concentrated expression within it. Anti-Semitism has deep and historical roots. Nevertheless, any flaw in Israeli conduct, which initially is cited as anti-Israelism, is likely to be transformed into empirical proof of the validity of anti-Semitism. It would be a tragic irony if the Jewish state, which was intended to solve the problem of anti-Semitism, was to become a factor in the rise of anti-Semitism. Israelis must be aware that the price of their misconduct is paid not only by them but also Jews throughout the world. In the struggle against anti-Semitism, the frontline begins in Israel. There will always be some Jew haters and Nazi holocaust deniers. (I accept that there is room for debate about the number of Jews who were exterminated but I regard Nazi holocaust denial as an evil on a par with the mass murder of Jews and others). So what I mean when I say the sleeping giant of anti-Semitism might well have died in its sleep is that it would not have come back to life again as a force capable of seriously threatening the wellbeing and security of the Jews. If they don’t do that there will most likely be a final Zionist ethnic cleansing of Palestine followed at some point by a wide awake sleeping giant of anti-Semitism going on the rampage again. Regrettably, this essay contains a number falsehoods. For starters, the most criminal acts committed by Israel in Gaza was not a "conflict". It was a slaughter of defenceless people in a concentration camp by a terrorist state using its land, air and naval forces; something even the maligned Nazis didn't do. Also, we hear endlessly about 'freedom of speech' and in the same breath no-go areas if one wants to expose imposed narratives. I agree with Alan's analysis, but to my opinion he only mentions ONE ingredient of the receipe. The (regrettable) rise of anti-semitism is a big soup of many aspects and it seems to reach the boiling point. Not the least that people are waking up to the fact that the banking world (predomantly jewish) is selling them out. As usual the innocent common people on both sides of the spectrum. Then the jewish influence in politics is disproportionally strong on bothe sides of the Atlantic. This all on top of the warmongering attitude of the Isr. gov. towards Iran, wanting the USA doing the dirty work for them. More.......?? A Dutch woman, lived in Isr., visited Gaza and the W.Bank (often). Yes Agreed: If world Jewry, and at this time a Zionists controlled Ziovill / Israel, would publicly agree, the Palestine are Semitic also. And the Zionist actions to date are against there own book. Now creating a world contemptible Ziovill. by there stealing and squatting on Palestinian lands, That is nothing more than out right land theft, from Semitic, Christian and Muslims Palestine's. There Semitic brothers and sisters. With there bloody soaked hands now crying out again, Iran can not have any nuclear weapons. And putting efforts forward to alter American working on bringing Iran to a agreement, in not building a weapon, As Iran has affirmed would not be allowed to be use by there own book the Qur'an even for there own defense. As if Ziovill was not siting on these weapons now. to use at there amoral desecration, Even if undeclared. And now to go to or U.S. House of the, six pointed chair seat stars, lobbing to send your American Finest to fight another war for Ziovill again. It is becoming clearer..more evident every day...That 'The Jewish Population' ( most of The People who can still Think For Themselves ) are now beginning to realize that Those who are ''in charge '' ( b.Netty And his Henchmen ) are Really Bringing More angst down on All...Than they had anticipated. And when this Truth Gets Through Settling in.... Is when Changes to make a difference Will Be Made. As they say ''the Change that Matters has to come from The People ''. The old must be allowed to pass away..And Give way to a Better Way to Go. Using both Reason and logic can pave the way to a better world for all. It is not like There is Any More Time to be wasted. There is Not. I don't see anything in Jonathan Cook's article that supports your comments. Also, what do you mean "imposed narratives"? The Holocaust and the like aren't imposed imposed narratives, it is an objective historical truth, it is what happened. Alan Hart isn't advocating denying anyone's freedom of speech. The deniers, Hart mentions, aren't brave intellectual iconoclasts, they are intellectual hacks that degrade intellectual discourse and they have nothing to offer the people who are really exposing imposed narratives. Lord Sack is known as being a "Zionism foot-soldier". In 2012, Rabbi Sack claimed on BBC that Israel attacked Gaza Strip because the enclave was becoming Iran’s front line against the Zionist entity. Berlin-born Jewish professor Shmuel Almog (Hebrew University, Jerusalem), has claimed that the term with hyphen and without it has different meanings. The term ‘Antisemitism’ was coined by Wilhelm Marr in the 1870s. It was applied to European Christians who hated Jews. However, when it’s written with hyphen ‘Anti-Semitism’ – it means hatred toward Semite people who are found in far greater numbers among Arab Muslims and Christians than the entire world Jewry. You ROCK, Alan! Yesterday here in Kalamazoo we had a fine talk given by a Catholic Bishop who had been a part of a delegation to tour Israel and Palestinian territories last September. We learned that Bishop Paul Bradley had been like so many other Americans, quite un-informed as to the reality of what life is like for the Palestinians right now, today. Our local group, Kalamazoo Interfaith Coalition for Peace and Justice, sponsored the talk, and even though Bishop Bradley definitely had his eyes opened thanks to the trip, he still has a lot to learn of the situation there. I encourage you to contact the United States Conference of Catholic Bishops, www.usccb.org/comm. Thank you for what you continue to do with intelligence and class, Alan.